Is Jordan Eberle the NHL's Next Superstar? 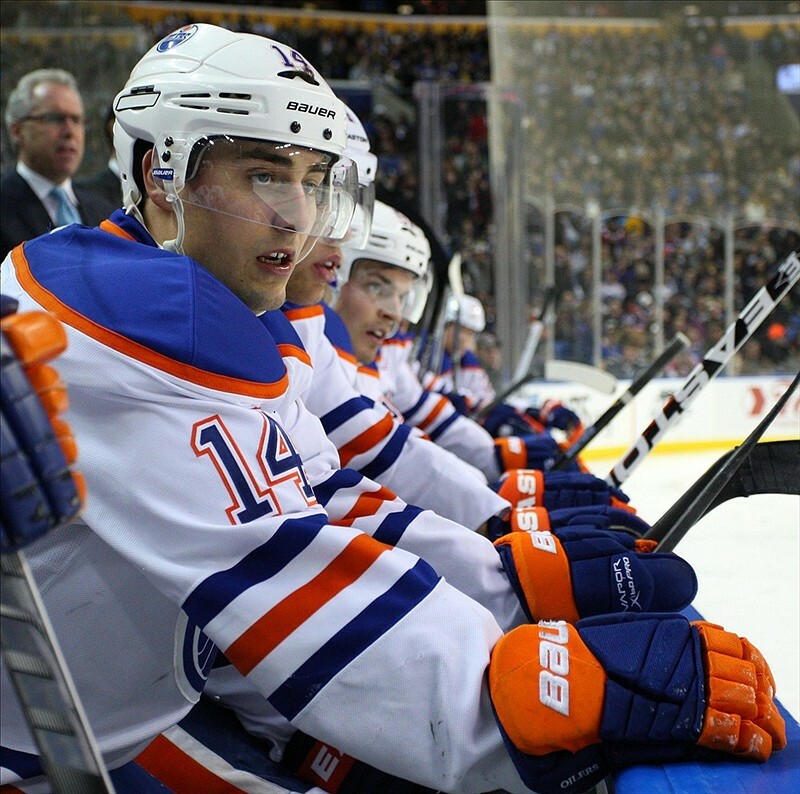 Is Jordan Eberle the NHL’s Next Superstar? Jordan Eberle might be one of the NHL’s fresher faces, but the right winger has given hockey fans a glimpse of what he will be able to offer the Edmonton Oilers as they gather the necessary pieces for contention in the Western Conference. After enjoying a solid rookie campaign (18 Goals, 25 Assists) in 2010-2011, Jordan Eberle elevated his game to a level that fans, critics, and analysts alike might not have expected. Even though the Oilers missed out on a playoff berth during the most recent NHL season, many of the team’s young stars made it quite apparent that there is a very bright future in Edmonton. While rising talents such as Taylor Hall and Ryan Nugent-Hopkins have made a name for themselves in the NHL, Eberle’s extreme spike in performance has left fans wondering if he will eclipse his previous points totals during the next NHL season. Exceeding expectations after having a tremendous season can wear on any NHL player, even the most seasoned of veterans, but statistics and circumstance may just be on Eberle’s side. With Jordan Eberle being signed to a six-year $36 Million contract earlier last week, Edmonton’s young core seems to be set for the near future. Ryan Nugent-Hopkins will undoubtedly receive a lengthy offer from the Oilers once his entry level contract expires, and fans could possibly be seeing a trio of Eberle, Hall, and Nugent-Hopkins for years to come in Edmonton. While Hall and Nugent-Hopkins may be different talents in their own rights, it was extremely important for the Oilers to extend their young talent for a number of reasons. Extending Hall and Eberle to lengthy, yet fair contracts can serve as an indicator of Edmonton’s willingness to secure its young talent for the long haul. Even though it was highly unlikely that the Oilers would have wanted to part ways with Eberle and Hall rather than paying them, the two signings have made it clear that Edmonton’s future will not be sacrificed for some outside shot at short-term success. the near future, especially if the youngsters illustrate that they can keep building on their chemistry together. 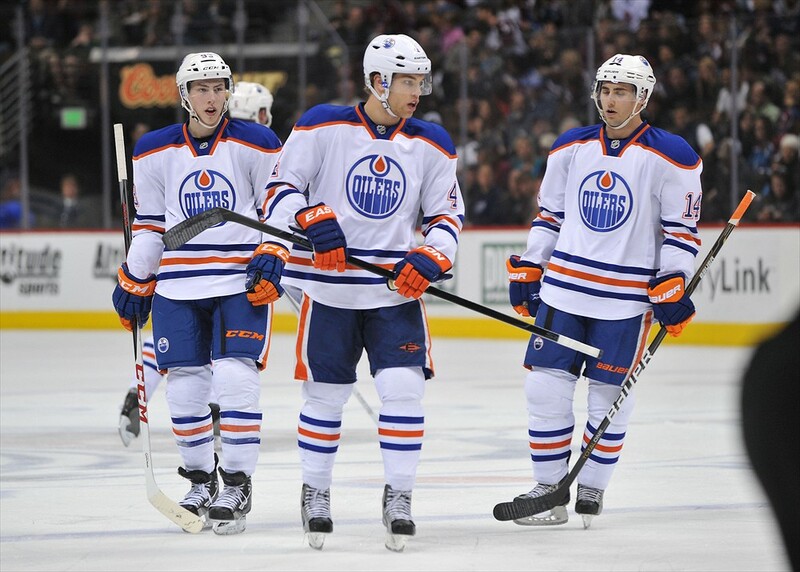 It might be rash to think that the trio will be inseparable for the duration of their time in Edmonton, but there is little reason to believe that the three players won’t feed off of each other during their stay on the Oilers’ top line. Playing with Hall and Nugent-Hopkins already afforded Eberle the benefit of having a 76-point sophomore campaign, and continued maturation alongside the center and left winger will only help Eberle’s rise to stardom. It is not as though the right winger is being placed on an unfamiliar line and is being expected to replicate his success while playing with strangers. Instead, Eberle will be given every opportunity to grow up with players his own age, and will likely be pushed to greater success by a pair of very talented line-mates. Since Eberle will be surrounded by familiar faces whenever the NHL CBA gets hammered out, fans shouldn’t temper their expectations for the winger. While John Tavares posted 81 points in his third year with the Islanders, his constant improvement has been made that much easier with Matt Moulson on his left side. Much of the same can be said for Eberle as he is already surrounded by two players that will strive to make him better as they get older as a collective unit. Contract signings might not be any type of indicator for NHL stardom, but at least Jordan Eberle knows that his organization is encircling him with the talent that will one day bring the Oilers back to the postseason and could very well make him into a bona-fide superstar in the NHL. Some might say that statistics do not tell the whole story for any professional athlete. However, stats do paint a telling story for an up and coming talent such as Eberle. During his rookie season, Eberle posted 43 points (18 Goals, 25 Assists) in 69 games and registered an unsightly -12 rating. Even though Eberle’s numbers did not automatically scream Rookie of the Year, he tallied a fair amount of points that deserved some recognition and consideration. Not much else could have been asked from a rookie that was placed smack-dab in the middle of a rebuilding process, but the right winger displayed an ability to go above and beyond what was expected of him in only his second season in an Oilers uniform. As Eberle’s sophomore season began, a new addition in the form of Ryan Nugent-Hopkins was added to Edmonton’s roster. Nugent-Hopkins promptly scored 52 points (18 Goals, 34 Assists) in 62 games and was undoubtedly one of the factors that contributed to an increase in Eberle’s numbers. Eberle played in all but four games during the 2011-2012 NHL season and responded well to his new teammate as he put up 76 points (34 Goals, 42 Assists) in just his second season as a pro. While Eberle’s point total increased by 33 points, his +/- rating improved by 16 points as he recorded a +4 rating and illustrated an improvement in his two-way play. Statistics such as +/- have a tendency to be a bit inconclusive when determining the whole scope of two-way play, but some of Eberle’s Corsi statistics coincide with his improved +/- rating. The winger’s Corsi Rel QoC jumped from .189 in 2010-2011 to .483 in 2011-2012 and suggested that Eberle faced off against a higher quality of competition during his sophomore campaign than in his rookie season. Eberle’s Corsi On slightly improved (-3.27 to -3.02), but one of the more telling stats during the young winger’s second season was evidenced through his On-Ice Sh% which almost doubled (7.94 to 12.84) from his rookie campaign. While Eberle’s Corsi QoC and Corsi Relative both took a hit during the 2011-2012 NHL season, it was also evident that the forward was extremely valuable to his team when he was on the ice. Jordan Eberle isn’t simply a scorer playing a one-dimensional game in Edmonton. The forward’s play-making abilities make him an invaluable asset to his team when he is on the ice as Eberle has the ability to envision a certain play and execute it. The no-look pass wasn’t invented by Jordan Eberle (and this certainly wasn’t his only great no-look pass in Edmonton), but setting up Ryan Smyth for that type of a goal was a thing of beauty. Not only did Eberle thread a perfect pass to Smyth for the goal, but his calm and composed demeanor while drawing the opposition toward him spoke volumes about the youngster’s comfort level in the NHL. While Eberle’s ability to draw attention to himself definitely helped create an opening for Smyth on the above play, the forward’s body language and ability to properly gauge distances kept the opposition attached to him instead of falling back to protect a possible pass. Video review of one particular play may only be able to tell us so much about a particular player, but one only needs to see the look on Ryan Smyth’s face after the play to understand how much more could possibly be in store for the young right winger. On the Way to Stardom in Edmonton? Jordan Eberle’s stock is certainly trending upward in Edmonton and there is little reason to believe that Eberle isn’t on his way to becoming one of the NHL’s elite players. Having a young supporting cast with names such as Hall and Nugent-Hopkins will only help Eberle in the long run as he becomes more accustomed to the NHL. While Edmonton might be a piece or two away from getting back into the Western Conference playoff picture, Daryl Katz and Steve Tambellini have created an environment for healthy competition for their young players. When the Oilers feel that it is necessary to sign Ryan Nugent-Hopkins to a new contract, then a solid precedent will already have been set. Since Taylor Hall and Jordan Eberle both signed extensions that will pay out $6 Million annually, Nugent-Hopkins can realistically expect to get the same type of offer if he shows a consistent effort to keep up his offensive output. While Eberle will most likely be paired with his fellow youngsters on Edmonton’s top line, the trio of players will continue to learn how to feed off of each other as they get older. Not only does Edmonton’s nucleus feature a young group of players that are expected to come into their own at one point or another, the team boasts three players that could become NHL stars in their own right. The future may be hard to predict, but there is a body of evidence that suggests that Jordan Eberle is well on his way to becoming one of the NHL’s most lethal offensive players, and the Edmonton Oilers stand to be one of the direct beneficiaries of such an occurrence.